natural horsemanship | Chronicles of a "Mini-Pro"
So keeping up my record as “world’s slowest blogger”, I wanted to give everyone an update on Izzy’s first official off-farm outing, which happened way back in May. Better late than never, I suppose! DRF Isabela, better known as Izzy to her friends, just turned three at the end of May. Last year, she learned the basics of longeing, went on short trail walks ponied off her friend Marquesa, and practiced wearing a bridle and surcingle. She had the winter off, and for this year, my goals were to build on this foundation by solidifying her longeing skills, introducing a saddle, working on long lining, and maybe, if all went well, getting on and doing a few short walk abouts by the time school started in the fall. So this spring, when I started the process of getting her back into a routine of being regularly handled, I was quite surprised to find that she had gone rather feral. Leading her had become like trying to walk a dragon. She wasn’t being mean or naughty per se, just overly joyful. It was as though she had learned to leap and buck over the winter and wanted to show off her new skills. The problems for me were several. 1) Most of the time, I work with Izzy alone, and I didn’t want to get hurt. 2) My arena is only partially fenced, and I wasn’t confident I could hold onto her. 3) Winter hung on a LONG time this year, and the ice and snow didn’t officially clear out of my partially fenced ring until the very end of April, meaning that even if #1 and 2 weren’t issues, I didn’t have great footing to work with. My ring in late April, featuring a newly purchased round pen (the acquisition of which was motivated by Izzy’s joyful behavior). All of which left me SERIOUSLY QUESTIONING my mid-March decision to sign up for an in-hand clinic to be held at the very beginning of May with eventer and natural horsemanship trainer Tik Maynard. I much enjoyed Tik’s presentation at the Area I Annual Meeting in January, and when I saw that Fox Hill Equestrians in Barnstead, N.H., would be hosting him, I was immediately interested. Tik is based in Florida, and so opportunities to work with him for a northerly based equestrian are not likely to happen often, and Fox Hill is an easy twenty minutes up the road (as in, I turn right out of my driveway and then right onto the street with the farm, more or less). It seemed like the perfect first ‘off the farm’ outing for my youngster. Tik was offering a lecture on horsemanship theory each morning, followed by private and small group in hand sessions and jumping lessons in the afternoon. I decided the sensible plan was to audit day one through at least the morning session, then bring Izzy for day two. Despite her joie de vivre, I went ahead with my plan to bring her to the clinic, and I am so grateful that I stuck with it, as we both learned a great deal. The horsemanship lecture focused on the theme of how horses learn best and gave an overview of Tik’s training philosophy. One of the main components is that humans must learn to think like a horse; when one can do that, it is easier to set up questions which horses are willing to answer. Horses have evolved to quickly evaluate which stimuli are worthy of response, and which can safely be ignored. Only those animals which have correctly and efficiently solved this riddle survive, and we must respect that our domestic animals retain these wild traits. Here is Izzy, demonstrating that she is not all that concerned about crinkly tarps. This is her friend Devyn, who has given us a great deal of assistance as a second set of hands! To this end, horses pick up on visual cues and details that we miss, and they may react to them in unanticipated ways. We all have been guilty of responding to these behaviors defensively or angrily, but the truth is that getting emotional in this situation doesn’t do much to improve the relationship or communication between you and the horse. The things which motivate horses to do a certain behavior, including ignoring an unpleasant or unfamiliar stimulus, are not the same things which motivate humans. Horses seek safety, food, comfort and play, in that order. Smart trainers use these motivators in their work. Because horses seek comfort, creating situations which increase a horse’s comfort when they provide the desired behavior automatically reinforce that outcome. A common example of this in practice is the use of the rider’s leg; the pressure is slightly uncomfortable, but when the horse goes forward and the pressure goes away, the horse’s comfort level increases. Praise itself doesn’t mean much to a horse, but the release of pressure does. Izzy learned to wear a saddle this June. Horses are scared or nervous of things which act predatory; this includes anything which comes running towards them and things which are going fast, being loud, or behaving erratically. They prefer to be approached slowly, which might not be the way we enter the paddock when our minds are preoccupied with catching a horse for a lesson—explaining why a normally cooperative horse might refuse to be caught. Tik encouraged us to think in a positive frame of mind when asking the horse to do something. For example, think “Let’s do this” instead of “Stop doing that”. Hey, can I help you with the weedwhacking? Solvable puzzles introduce to the horse a little bit of pressure; some pressure is needed for growth and learning, but finding the right amount is key. Too little and no learning occurs, too much and the horse may become so anxious they can’t learn at all. Because horses seek comfort, they are going to look for the release of pressure, whether that pressure is physical or mental. “Pressure motivates but the release of pressure teaches,” said Tik. Tik works with one of the group horses. When Tom gave the right response, Tik angled his body slightly away, shifted his weight onto one leg, and exhaled. They took a break. The pressure was released. For ground work, Tik prefers a rope halter, a heavy, dense, long rope, and a sturdy stick similar to Parelli’s Carrot Stick. Depending on the situation, Tik might choose a rope that is 12’, 22’ or even 45’ long. Practicing waiting while not being in each others’ space. The next set was a group lesson with five horses working in hand at once. The animals were at different stages of training as well as mental focus, which gave Tik the opportunity to speak to a variety of exercises and possible outcomes. But he started with having the horses get comfortable with their handlers standing about six feet away from them, with slack in the lead rope. “On the ground, you sometimes want the horse’s eyes and ears towards the handler but sometimes you want to direct them and their attention elsewhere,” said Tik. One young handler and her sweet steady eddie type schoolmaster worked on learning to give from pressure on the nose. “For a lesson horse or a kid’s horse, you need to think about how sensitive you really want that animal to be,” said Tik. My friend Sarah works on sending her Thoroughbred, NASA, over the tarp. He is for sale, by the way! Horses can be responsible for four things: to maintain their speed and gait, to maintain their direction, to be looking where they are going, and to act like a partner. As trainers, we should not be doing these jobs for the horse. “But horses must be taught how to do these things,” said Tik. Other than going for short trailer rides around the block last summer, Izzy has not left our farm since her arrival on a bitterly cold morning in March of 2017. I am not sure who was more nervous for the outing—Izzy or me! Two of my students, Julia and Nikki, tagged along for moral support, education and extra hands if needed. Izzy is enjoying a “release” moment after getting a riddle right. Note Tik’s unevenly weighted feet and relaxed arms. I don’t think anyone else brought an animal as young as Izzy; I held her in the barn aisle while Tik wrapped up his morning lecture on day two, and although she danced and jigged a bit while waiting her turn, I felt she was really trying to be good. That said, I had no idea what to expect from her when we got into the ring. I think Tik fairly quickly assessed that her brain and energy needed to be redirected, and so he came back a little early from his post-lecture break to get started. “Do you mind if I work with her for a few minutes?” he asked. I was so relieved! Yes, please! The first thing he did was swapped out my long line for the sturdier rope line he had been using on other horses. He then let Izzy move out onto the end of the rope, where she leaped and ran and displayed the athleticism which I hope will be used for good things in the future. He wasn’t expecting her to be totally focused on him all the time; in fact, that day he said that he would be happy if she was with him 30% of the time. Izzy is actively backing away from Tik in this video grab. It was truly amazing to watch Tik work with Izzy, who he had just met, in such a respectful yet constructive manner. She had moments of simply moving around him at the end of the line, and other moments of youthful behavior. He could halt her and turn her. They went and checked out the mirror together. As she started to visibly relax and become more mentally calm, Tik led her to the tarp and a wooden bridge which had been used in previous sessions. She inquisitively just walked right up to and over both objects. I was not surprised that she handled them so well, as this has been her typical response to something new, but it was lovely to see that she had the same attitude in a new place once the zoomies were behind her. Once Izzy became more relaxed in her environment, Tik was able to enjoy some snuggle time with her. She is clearly miserable. Tik wrapped up his work with Izzy by playing with some halt, walk, halt, back up transitions, teaching her to cue into his body language. He tipped his shoulders forward to encourage her to walk, squared them over his hips for the halt, and inclined them slightly backwards to cue her to back up. After this, I took over for a few moments, practicing the same in hand transitions, and finally ending with her just hanging out all the way at the end of the long lead, while I turned my back to her and stood weighted more on one leg. I’m told she did lots of yawning, but of course I wasn’t allowed to peek! I’m trying so hard to not look at her while audience members asked Tik questions about our session. “The more emotional something is for the horse to learn, the longer the break they get,” said Tik. Coming to this clinic, as mentally stressful as it was for me to do it, was absolutely the right choice to make at this stage of her training. Izzy was like a changed woman after interacting with Tik, and both his feedback and watching how he used his body language to interact with her helped to give me the confidence to do what I had sort of suspected she needed me to do—get a longer line and really send her forward when she wanted to act up. So long as your response to her is fair—I am sending you away to work a little bit not because I’m mad but because we have a job to do—she responds positively, and rather quickly settles down. Izzy has learned the basics of long lining this summer. This project was definitely not do-able until after our clinic! Thanks Devyn for the photo. I have continued to play with some of these techniques this summer, but I will admit that I have much more to learn. It was a fascinating opportunity to do something totally different with one of the horses, and I am pleased that it was such a positive experience! I had the occasion to attend the US Eventing Association (USEA) Area I Annual Meeting out in Holyoke, MA on January 7, 2018. I try to make it every year to attend the event organizer’s meeting, and getting to stay to hear the guest lecture each year is an added bonus. I was quite enthused to learn that Canadian event rider Tik Maynard had been asked to speak at this year’s meeting. Recently, I read a piece Tik wrote for Practical Horseman about the ground work training he had used with his Retired Racehorse Project mount, Remarkable 54. I found the article well written and thoughtful, and had a sense from it that Tik was an educated, thinking horseman. In his presentation, which he called, “7 Big Picture Ideas to Get Along Better with your Horse”, he did not disappoint. My overall impression of Tik as a horseman only improved upon hearing his introduction—the son of a show jumper and a dressage rider, he attended college in his native British Columbia before embarking on a quest for absolutely top of the line horsemanship education by spending nearly two years apprenticing with riders such as Ingrid Klimke, Johann Hinneman, Anne Kursinski and David and Karen O’Connor. The work was hard and sometimes he didn’t measure up—in fact, he was asked to leave Hinneman’s barn for “not being good enough”. He worked hard to spend time with some of the best in different disciplines, even though eventing became his main passion. At the O’Connors, he had his first exposure to natural horsemanship, which completely changed the way in which Tik approached horse training. Tik Maynard at the Area I Meeting. This experience inspired him to do a working student position in Texas with a western rider who specializes in training cow horses using natural horsemanship techniques. I may be getting the exact timeline wrong here, but you get the general idea. In working at this facility, Tik says that he didn’t learn so much about riding— he learned a lot about horses. He became more interested in the behavioral side of horses—how they think, how they respond, and how they process training. Tik’s personal philosophy would seem to prioritize a horse which is engaged in the learning process. He talks about “The Look”, the moment when the horse looks at the trainer with both eyes and ears focused, seemingly saying, “What are we doing today?” He emphasizes a difference between communication and control in training. And though he was told that there was no way that he would be able to combine natural horsemanship training with developing competition horses at the highest level, he has not allowed such negativity to dissuade him from his path. In his presentation for the Area I Meeting, Tik highlighted seven concepts which he has found to be important in working with his horses in training. Taming versus training. Tik argues that there are horses being ridden and shown which are barely tame, never mind trained. For example, when the horse is showing even a slight fear reaction to certain stimuli, or grossly overacts to a small stimulus, these can both be signs that the horse is not fully ok with what is going on. 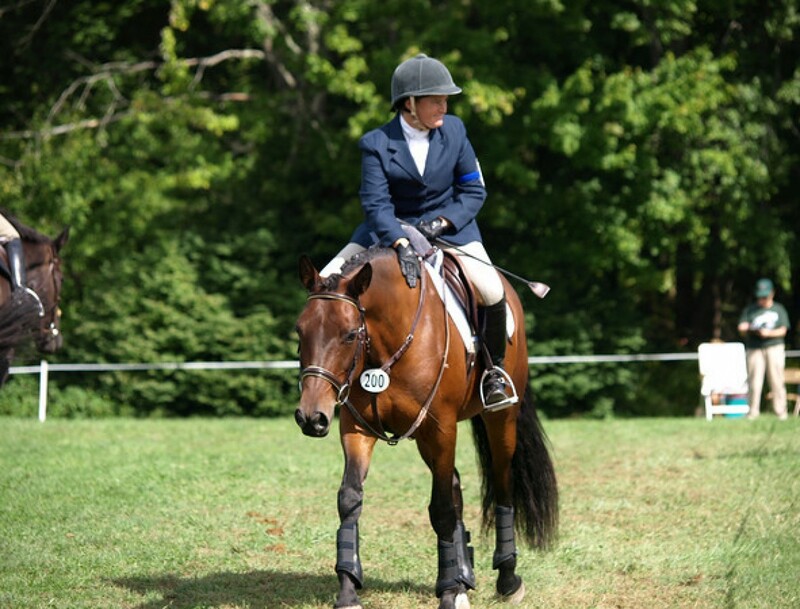 “It is like you have this horse simmering with energy just below the surface,” says Tik. “The horse reacts to the sound of a twig snapping, but that is not the cause of the horse’s tension.” Tik gave as an example of one of his horses, Carollina, who needed to be taught to really think forward. Becoming exposed to unfamiliar stimuli should be like a game. Make your session with your horse like a song. When working with a horse, your training session should contain moments at different levels of intensity. The warm up is gradual, and then you may progress to a new skill or lesson which is higher intensity, before the energy gradually comes down towards the end of the session. “All moments are not created equal,” says Tik. Tik tries to end each training session by dismounting in the area where he rode, facing away from the barn. He then loosens the girth and might remove the bridle, and waits there until the horse lets go and takes a deep breath. Learning to cross tie is one important basic skill which all horses should be taught. Make your horse’s world neutral. There are stimuli which will attract your horse (positives) and those which will repel them (negatives). The trainer needs to shift the horse’s energy towards where they want it to go to. As an example, Tik spoke about acclimatizing his OTTB, Remarkable, to the coliseum in preparation for their freestyle performance at the Retired Racehorse Project. The ring was full of banners, which worried the horse. So Tik led the horse towards the banner, and had an assistant feed Remarkable a small treat from the opposite side of each banner until the horse began to relax. Trainers need to make themselves be more interesting than anything else going on. This means that the lesson being taught must be more interesting; trainers must learn when and how to be big with their actions (body, waving a flag) and when to be more subtle. Which leads really well into Big Picture Idea #5…. Stop at the top of the bell curve. As a horse progresses through their training, they will get better with a new skill and then often start to get worse—this is a sign that they are bored, frustrated or similar. Tik reminded the audience that “repetition is the mildest form of punishment”, so a better approach is to get to the top of the exercise and then stop, even if the horse gets there quickly. Continuing to repeat the exercise once the horse has already gotten the point of it for the day will mean that they are likely to end their lesson at an energy level higher than a 3 (see Big Picture Idea # 3). Be a problem solver. Think. Be creative. Seek help. Think laterally. “The more you do it, the better you get,” says Tik. What are the Olympics of Everything? Tik joked with the audience, “what if there were an Olympics for cross ties, for leading, for being caught, etc?” His point is that no matter what kind of interaction we have with the horse, we can always work to make it better. It is upon these smaller steps which big goals are achieved. “Have your end goal in mind but always stay in the present,” says Tik (seems relevant to so much in life, no?). In listening to Tik’s presentation, as well as his responses to audience questions, I was struck by his calm demeanor. He seems humble and authentic. He did announce that he is working on a book with Trafalgar Square, scheduled for release in June 2018—I suspect that this text will be one to add to the library. c 1998 Trafalgar Square Publishing, North Pomfret, VT. 148 pages. From Birth to Backing provides a glimpse into the training philosophies of Richard “Max” Maxwell, a UK based horse trainer whose methods are strongly influenced by Californian ‘horse whisperer’ Monty Roberts. The text is logically arranged into age-appropriate chapters, with an overarching theme woven throughout that each step is essential and must be taken in sequence. Therefore, Maxwell’s methods are useful to consider even if you are working with an older animal whose performance requires taking a step (or two or three) back. Maxwell takes readers through his step by step process, which begins with an overview of imprinting a foal, to introducing basic handling, to developing respect and trust in humans, to ultimately accepting the introduction of equipment and a rider. While his methods are grounded in the philosophy of Roberts’ “join up”, there are no gimmicks here—no special halters, patented flags on a stick, etc. All the methods and techniques which Maxwell describes could be executed by any educated and conscientious horse owner, using equipment they already own. Maxwell is clear to emphasize throughout the book that to be the trainer of a young horse requires confidence and consistency; he recommends seeking outside help if the natural behaviors of a youngster trying to figure out the correct answer will be intimidating to the handler. However, reading this book is still helpful for those not able to undertake the whole process themselves, for understanding the importance of both a clear methodology and calm, consistent handling could assist the owner of a young horse in selecting an appropriate trainer to establish the basics. Maxwell emphasizes that when introducing new items to the youngster, do not approach them timidly or try to “sneak” the new object up onto them. “March up to the horse with the equipment, allow him to smell and investigate it, reassure him with your voice and place it firmly where you want it” (Maxwell, 1998, p. 73). What readers may appreciate the most about this book is that the layout is quite intuitive. Not only is each chapter focused on the particular skills most appropriate for a certain age range, but within each chapter, shorter segments help to break down the content into easy to comprehend chunks. The text is filled with ample illustrations which help to reinforce the main themes. While most of the concepts put forth in this book are familiar, one which I found rather unique was that Maxwell does not believe in using a lead horse when starting to hack out the youngster, as he feels that the horse should look exclusively to the rider for their confidence and safety. Maxwell says, “Very often, riding out with an older horse is an emotional crutch for the rider rather than the youngster. In my experience it doesn’t actually work that well either—I’ve never found that having an older horse there will stop a young horse bolting or misbehaving if he wants to” (Maxwell, 1998, p. 113). Instead, he proposes taking your youngster out on solo hacks, and exposing them to as many potentially frightening stimuli as possible, preferably while the horse is still learning their balance under a rider—that way, their resistance will likely be minimal and their confidence in the rider increased from the very beginning. Introducing your youngster to as many unfamiliar stimuli as possible, while maintaining a calm, confident demeanor, will help build their trust in a human handler. Overall From Birth to Backing is a fairly easy read, and its concepts clearly articulated and illustrated. One of the amazing things about publishing is how quickly a text can start to feel stale, and at almost twenty years old, this book’s photos could use an update. However, this should not take away at all from the essential message of the book: establish a trusting relationship with your horse from the very beginning, and from there nearly anything is possible.